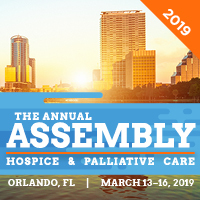 The Annual Assembly of Hospice and Palliative Care, presented by HPNA and the American Academy of Hospice and Palliative Care (AAHPM), is a three-day event that brings together nearly 3,500 of your colleagues and peers to share research, clinical best practices, and practice-related guidance to advance the specialty and improve patient care. Find out more details about the event including preconference information through the event brochure. Sign up and register today through the Annual Assembly event website at annualassembly.org.